Rant time: As a loan officer who has studied stocks and bonds for about 30 years (loan officer for 20+ years), it's frustrating when I advise people that they need to move quickly in terms of submitting the applications so that we can register the loan and be able to lock it. More often than not, when people don't heed this advise, they don't get nearly they rate I originally quoted, whether it's for a refinance or a purchase, missing out on significant payment savings over their loan term. Low rates don't mean a think if you don't lock at the right time. Rant over. Before last Wednesday, the bond market hadn't priced in the Fed's potential interest rate hike. 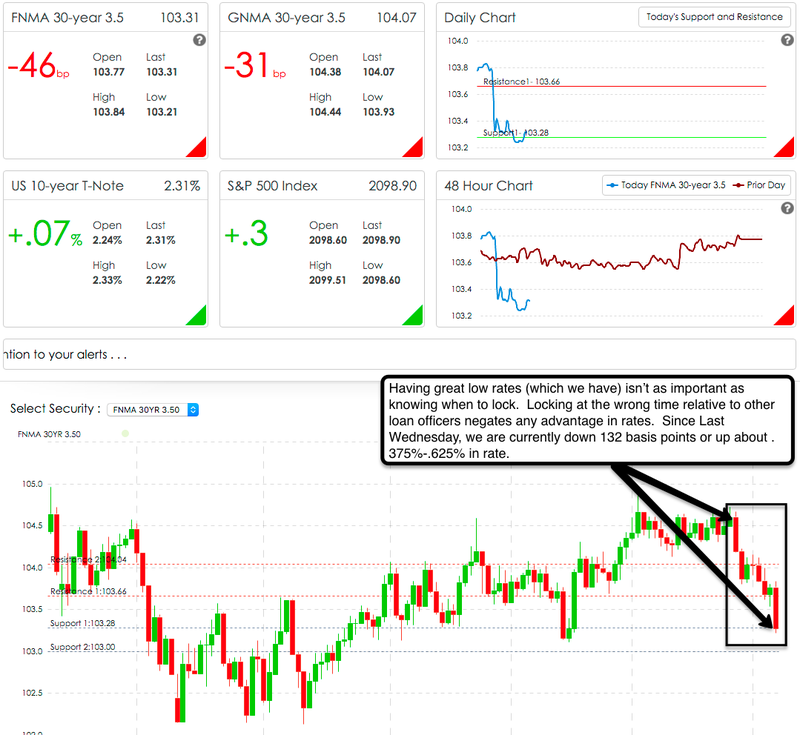 The selling that occurred last Wednesday and Thursday helped to get traders and the bond market closer to where they should be when the Fed starts their tightening. The likelihood of a December tightening move just went up significantly when Non-farm Payrolls came in at 271K vs. estimates of 180K. The truth of the matter is that many of these jobs are seasonal and may not turn into permanent positions but the fact is that the estimates were destroyed and this gives a lot of fuel to the fire of those who are starting to think that it's time to tighten. 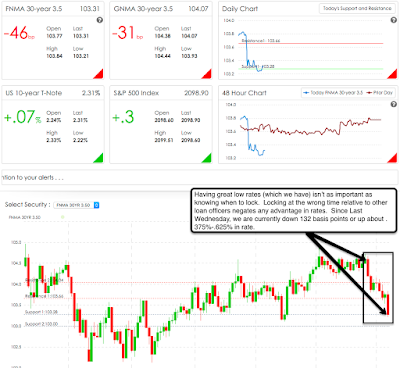 The 1st support level of 103.28 has been breached with the current price at 103.22 but we could see it hover around this price point for the rest of the day or more people might get involved in the selling and we could see a bigger move down. If it were me wondering whether I should lock or float, I'd lock and hope my lender has the option to float down in case rates improve enough to be able to do such a thing. The 2nd support level is at 103 - 22 basis points below the current price. The RSI (Relative Strength Index) is oversold but like I said the other day, I don't think that means much since the bias may be changing (which could be a huge understatement). In the end, a loan officer's job is to get the loan closed. Part of that job, though, is to help them get the best rate possible. If a loan officer doesn't understand key financial concepts to help the borrower understand them so that they can make proper loan choices AND if they don't understand how the financial markets work so that they can provide their clients with solid educated guesses on when to lock, they are doing their clients and referral partners a great disservice. Rant really over NOW. As always, contact me if I can help with anything mortgage-related - 702-812-1214 or 801-853-8720. This blog is my attempt to help with the mortgage-related item that deals with interest rates and locking or floating. I hope it benefits you. Make it a great day and a better weekend.